Every grower, almost without exception, will have occasionally suffered the death of a plant during cultivation, just when it seemed that everything was going along nicely. In this article, we’ll focus on the main reasons why seeds may not germinate properly, or why seedlings may end up dead in the first weeks of life. 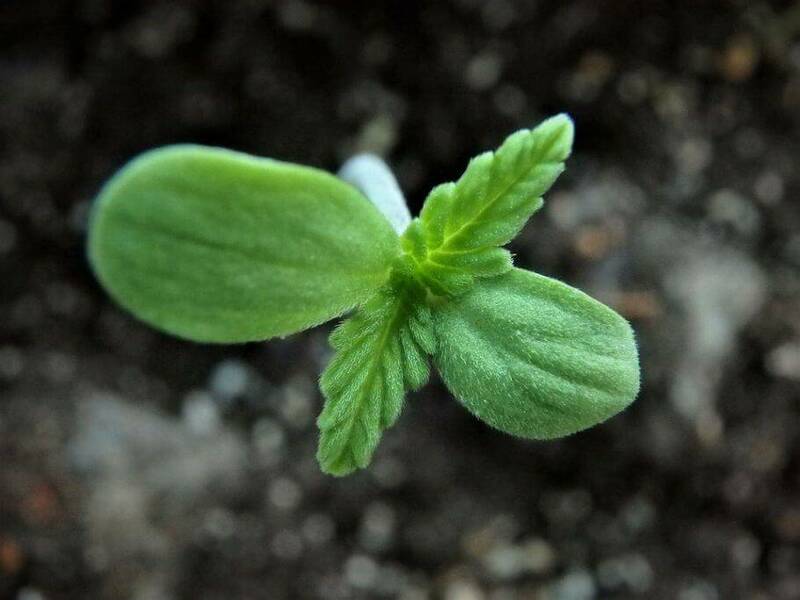 Cannabis seeds can die even before we start to grow them, in which case, when the grower comes to germinate them, they won’t open up and sprout at all. 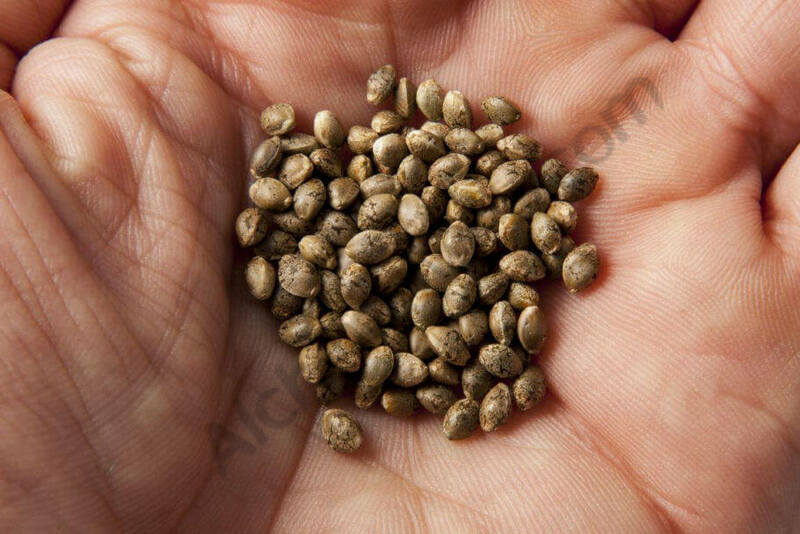 The seeds of the cannabis plant, like many other types of seeds, must always be kept in the correct conditions, especially if you want to save the leftover seeds for later use and ensure that they germinate well in the future. The same goes for unopened whole packs of seeds that have been purchased to store for later use. Sometimes, certain varieties are in high demand and there is limited stock, so the more astute growers will make sure they grab a few packs to keep in the vault until they find the time to germinate the cannabis seeds. 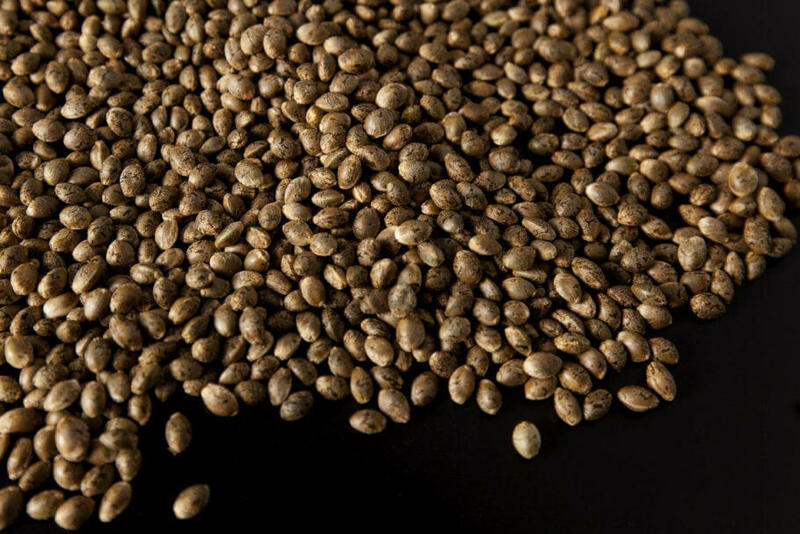 Cannabis seeds need very low relative humidity and relatively low temperature for their proper storage, so the best plan is to keep them in a “no frost” refrigerator, in which both the humidity and temperature are maintained at very low levels for better conservation of food. If we want to keep a seed package that’s still sealed, simply put the whole unopened pack into the fridge. The best place for its conservation is usually the small shelf where the eggs or butter are kept, although really any part of the fridge is ideal for storage. If we want to save the leftover seeds from a pack for later use, we recommend storing them in the original Eppendorf tube or container used by the bank. In the original packaging, these Eppendorf tubes hold the seeds and usually also contain a few small silica gel balls, included to maintain very low humidity (10 to 20%) and help to ensure that the seed does not lose any germination viability. If, however, we leave the seeds for a long period of time in any corner of the house it is possible that over time their viability to germinate will decrease, and when we plant them they may take a long time to germinate or indeed not germinate at all. it is also important to protect them from sunlight. So if you wish to save the seeds in the best conditions, always keep them in the refrigerator, well protected from air, light and moisture. How do we store leftover seeds to grow at a later date? 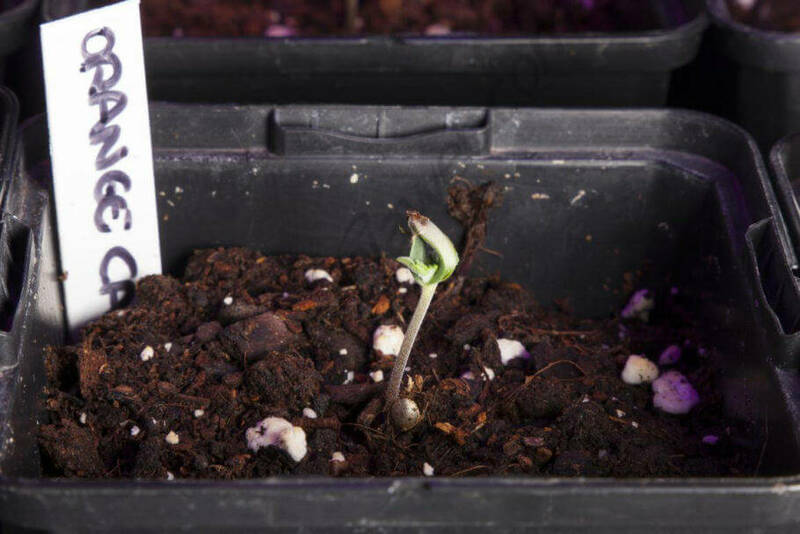 Death during the germination of cannabis seeds is one of the most frequent failures suffered by every grower over the course of his or her cultivation career. There are several possible reasons that can lead to the seeds dying before they even open and begin to grow, which we’ll examine here. Not all seeds have the same resistance to the errors that may occur during the germination process. Just as not all siblings are not all equal, neither are all seeds. By this, we mean that in the case of one seed germinating and the rest of them not doing so, it doesn’t necessarily mean that those that didn’t germinate were not strong or resistant, but simply that they were less so than the one that did germinate. If this occurs, we must ask ourselves why they did not germinate and look for any possible failings in the process. We start from the basic premise that the seeds require moisture, oxygen and a suitable temperature for germination; If one of the three aspects is not taken into account, it is quite likely that the seeds won’t end up germinating. 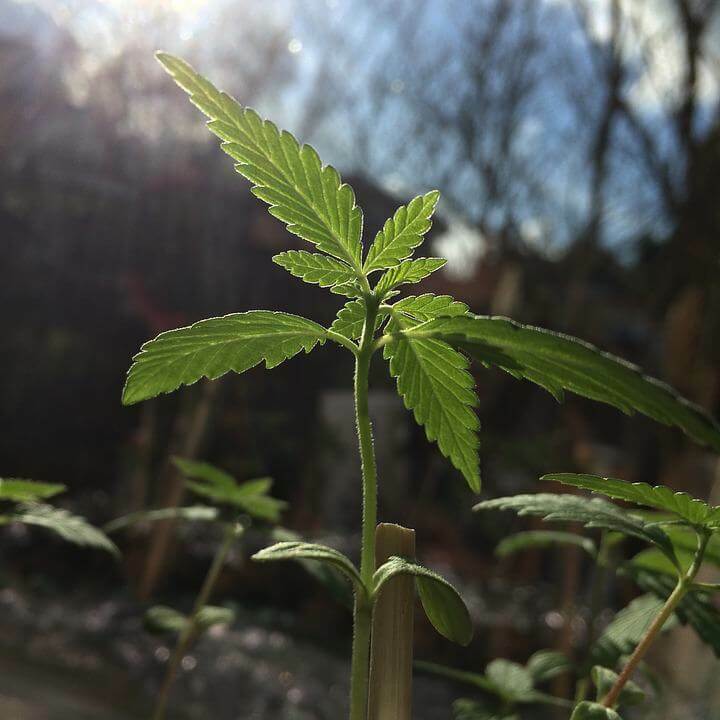 Putting the cannabis seeds in a glass of water and waiting 24 to 48 hours for their germination can be a fatal error for them. Re-hydrating the seeds in water is a good idea as long as they are not out of contact with the air for long, as they will be deprived of oxygen and most of the time they will end up dying; so if we use this method, we only leave them to re-to hydrate in water for a few minutes, although, preferably we will avoid any previous soaking or re-hydration (which in any case is not necessary). The reason for this is that tap water contains chlorine, which sterilises the water to make it suitable for domestic use. However, this chlorine disappears by evaporation after a few hours, so if the water then gets contaminated, the seed can be attacked by any number of pathogens and eventually die. This example also illustrates why we must always touch the seeds with clean hands; If the seeds are handled with dirty fingers, it can lead a fungal or bacterial infection to contaminate them and severely compromise their development. 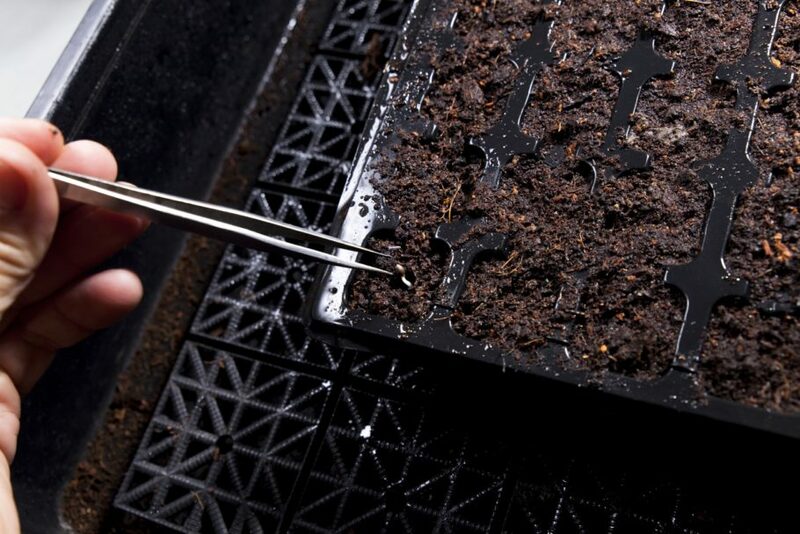 The same can happen in other germination media such as jiffy plugs, where the most common mistake is usually not draining away the excess water after re-hydrating the compressed peat. To this error, we can add that of burying the seed at more than twice its own depth, in which case it may not emerge despite having germinated perfectly well, but instead, simply end up rotting due to excess water and lack of oxygen. This error is also frequent in growers who germinate directly in the soil because when they first irrigate, the seed can be washed down into the soil resulting in them being buried too deeply, which makes it difficult for the seedling to reach the surface. It is always better to wet the substrate first, before sowing any seeds. If you want to sow the seed directly into the soil and do it properly, when growing outdoors you must also act to prevent seed predators. Ants, birds, and many other animals or insects are another common cause of seed failure during germination. In the case of ants, they eat the small, delicate root, leaving the plant unable to develop and condemning it to imminent death. 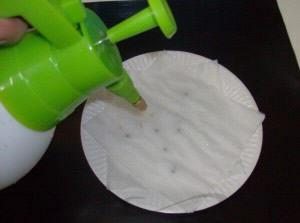 Placing the seeds between moist serviettes/paper towels is one of the best germination methods for beginner growers. Since you can easily see if the seed has taken root or not. But we must also bear in mind that the germination medium, the kitchen paper, is made of cellulose, meaning it is an organic material that will decompose and rot, just like any product of this type. It is, therefore, obligatory to change the napkins every day and a half, more or less, to avoid the seeds being contaminated by the pathogens that can appear as the napkins begin to rot. 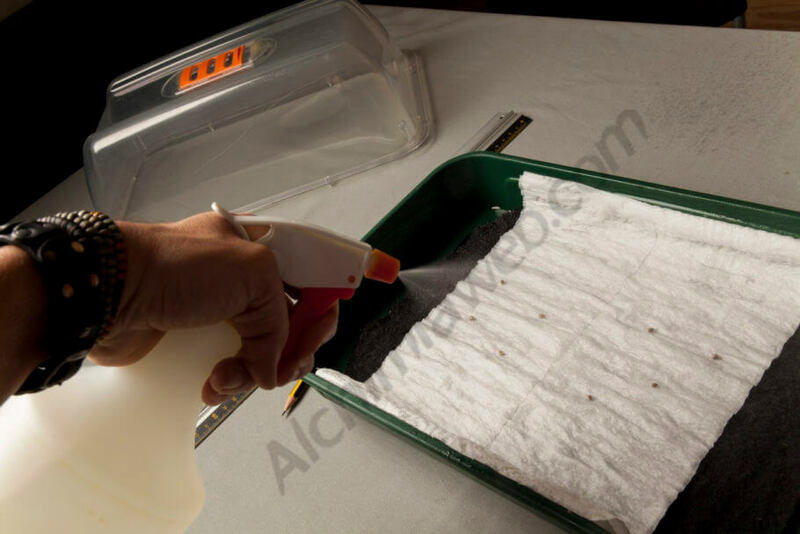 For this reason, we recommend placing the napkins in a deep plate and covering it with another one, leaving a small gap between the two so that air can enter, oxygenate the microclimate that is created during the germination of the seeds and avoiding them rotting. Just as excess water is one of the most common causes of germination problems, the lack of moisture is equally detrimental to the process. If outdoor temperatures are around 20 to 24ºC, then we shouldn’t need do much more than start the seeds to germinate and wait for them to open, following the precautions already discussed. But in case of having warmer or cooler temperatures, we must act to raise or lower the environmental temperature for optimal germination, and find the best location for germination to be successful. If it is winter, the plates holding the seeds are often placed on top of a low heat source to raise the temperature. We must, however, be careful: if this heat source emits hot air, the paper towels will dry out and the seeds will run out of moisture, affecting germination. If you realise this in time, you can re-hydrate the seeds and they will usually recover from and continue to germinate, although it is also possible that there will be consequences that may affect the subsequent development of the plant during its cultivation. If we haven’t noticed soon enough that the seeds have been left without moisture, we can assume that they will have dried up completely, with their consequent death, and this is even more likely if the seeds had already opened up to show the root. This can also happen very easily if we germinate during summer when temperatures are high and humidity is usually very low compared to other times of the year. The start of the growth period is a very important stage in a plant’s life, so several aspects must be taken into account so that it does not die of any of a number of causes. One of the most frequent problems is root rot due to excess irrigation and lack of oxygen in the substrate. Up till now, this has been one of the most common causes of plant death during the growth period, especially with beginner gardeners who lack previous cultivation experience. In addition, the likelihood of this happening increases considerably in crops with auto-flowering varieties; we’ll explain what to do here. When the plant emerges from the substrate, leaving behind its germination stage, it is crucial to take care with any excess water and the lack of humidity in its aerial parts such as leaves, stems and branches. When the plant is young and only has a very small root, its needs are few, it feeds and drinks very little. If we saturate the substrate with too much water, apart from halting the growth of the root (leading to little or no growth in the aerial parts), it creates the ideal conditions for the small roots to slowly rot. If the plant loses a part or all of its tiny root system in its first stage of life, it is almost guaranteed that it will die within a few days. If we use a small 0.5L to 1L plant pot for the first part of vegetative growth, before transplanting them to a bigger pot, we will be covering our backs in case of any excess of irrigation, since the substrate will dry out again much faster than in larger pots. For this reason, this issue is very common for novice growers who are cultivating auto-flowering cannabis plants, where the use of 20L pots is recommended from the start. It is often said that you must irrigate with an appropriate amount of water and nutrients for the size of the plant. As this is often complicated to carry out, as a rough guide we can irrigate the plants with an amount not more than 10 or 20% of the plant pot’s capacity. So, if they are 1L pots we will water from 100 to 200ml as long as it is not an auto-flowering plant. If the plan is to grow automatic varieties, then during the first two weeks we water with 100 to 350ml per irrigation, every 1 or 2 days. Remember that the substrate must maintain a minimum of humidity to allow the plant to feed and continue to develop normally. If it is raining and the plants are outdoors, it’s a good idea to move or cover them, to prevent the substrate from getting soaked, which could easily lead to root zone problems. The first stages of growth survived with success! We hope that this information will be useful and help to stop your seeds and seedlings dying. Don’t hesitate to leave any comments or questions, we’ll be pleased to help.